Moving time: 3 hr 33 min. Wind: Calm all morning; South winds 5 mph (tailwind) for last 15 miles. Weather: 55°F (13°C) in the morning; got up to 75°F (24°C) by end of ride at 2:00pm. Foggy for most of ride; clear skies after noon. I woke up to foggy skies this morning for the first time in a month and a half. It certainly is more humid here than most of the western half of the country and the fog didn't clear until noon. Central Washington state reminds me much of central Pennsylvania with its mix of farms, hills, and forests. There are barns in Pennsylvania that have the old Mail Pouch tobacco ads on them. 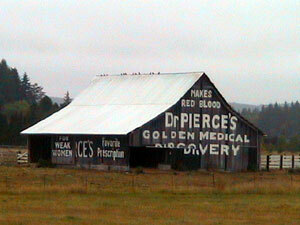 Here is a barn ad just north of Castle Rock that tries to sell some snake oil. It sure is unique. I passed through the Lewis and Clark State Forest, home to a large, old growth forest. Some trees in the forest are absolutely massive. I've never seen fir or cedar trees that are so large in my life before. It is truly a treat to see a forest that has never been logged. The hills here are steep at times but never more than 200 feet tall unlike the very high passes of the Rockies. Here is a shot of a particularly long and steep hill. Early in the trip I would not have been able to make it up this one in one shot. Now I can easily climb my way to the top without hardly breaking a sweat. These last few days give me time to reflect on the changes my body has undergone. I feel better about my physical condition now than at any other point in my life and conquering these hills with no problem makes me feel a great sense of accomplishment. 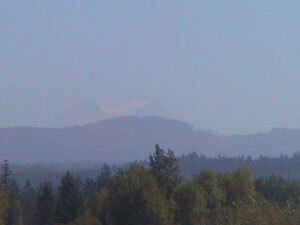 Mount St. Helens is about 35 miles from the route at its nearest point. I kept my eyes out for it yesterday and today and finally spotted it through the light fog near noon today. You should be able to see a silhouette of it in the very center of this picture. The crater and glacier are scarcely visible. 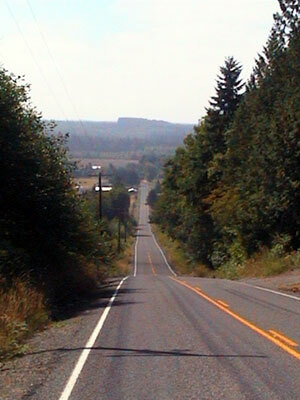 Today's ride was particularly short since the next town with camping or lodging is another 65 miles from Centralia. 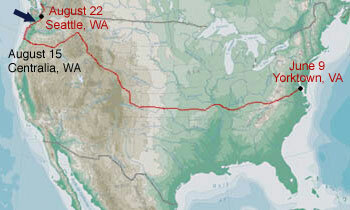 I will be able to make it to Shelton tomorrow then Seattle on Saturday. Centralia is a nice town with a bevy of antique stores downtown and an outlet mall near the Interstate 5 exits. 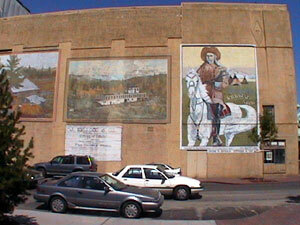 They also have a collection of historic building mural paintings throughout the downtown district. Below you can see the wall of one business with three murals on it. 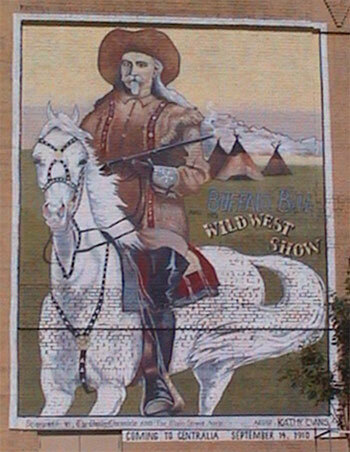 I particularly liked the Buffalo Bill mural.